Kid Made Entrepreneur Camp where the participants create art and hand crafted items (paper, sewing) as well as stuffed sweet potatoes. Is your child a budding businessperson? Restauranteur, artist, designer, or cook? At Kid Made Entrepreneur Camp, kids make crafty creations and fabulous foods, then sell their wares at the Farmers Market. 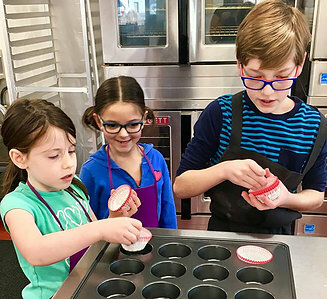 They learn valuable life skills along the way—and have a whole lot of fun. Look for our Kid Made Food Cart at Central Oregon farmers markets! Kid Made Entrepreneur Camp is a week long event where the participants create art and hand crafted items (paper, sewing, etc.) as well as stuffed sweet potatoes. They work on projects all week then sell them at the market. Half of the children work with crafts and the other half of the kids work the food cart.